Why is the Indian Left trying to win polls with cold blooded murders? Ahead of Kerala and West Bengal elections, we need to ask why, in a democracy, is it necessary to kill your opponent? I just met someone from Kerala who spoke about the ever increasing violence in the state. Almost everyday we hear of limbs bring chopped off, people being attacked, she said. Don't you find it odd that the same sort of reports are constantly coming from poll-bound Bengal? I asked her. The common thread amongst both states has been their long association with communism, which by itself has always been a very violent movement, anywhere in the world. Extreme forms of communism have taken hundreds of lives in Chhattisgarh and elsewhere, too, and yet is considered a good thing by many. Could there be something we are missing out on? Because communism succeeds wherever the youth become part of the movement. It is particularly successful because the initial indoctrination makes the "enemies" quite apparent: the capitalists, all right-wing entities. Creating an obvious "other" is the means to succeed. Only when you have eliminated those who are responsible for your woes, can you get a heroic narrative for yourself...all political parties are doing this but the communists invented it. 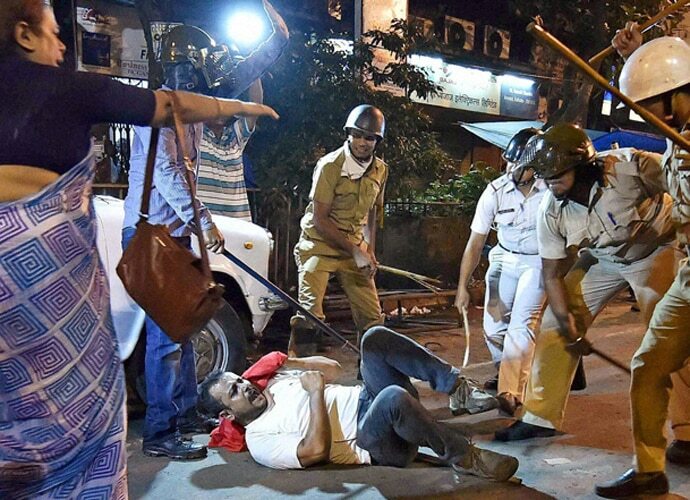 Police resort to lathicharge at a site of violent protest ahead on Bengal polls. This kind of extreme Left-wing positioning simplifies the task for the handlers of the indoctrinated young men and women, the lambs who are trained to slaughter. Mine is not a right-wing rant though it might seem like one, because we are all trying to understand why in a democracy it is necessary to literally kill your opponent? We need our elected leaders, therefore, to debate this poll related violence in Parliament. Perhaps that will shine a light on what is happening. In some cases the violence is said to be caused by political defections or old enmities. Nothing can justify it. Why is intra party violence not condemned with the same loathing as communal violence is? Isn't the state, especially whichever party is in power, responsible for not seeking out the culprits? Just yesterday two CPM workers were killed by two TMC workers. Could it be that the TMC workers felt safe and secure, knowing they would allowed to get away? Should this carte blanche be given? Doesn't the killing of small town leaders impact the overall election result? Of course it does, because it frightens the electorate. They too realise that the violence can escalate at any time especially if word leaks out that they have not voted for those they have been told to. Indian democracy continues to be at the mercy of political parties. No matter what the spokespersons say, it will be difficult to bring a "real" result to the table, till there is peaceful polling. And that cannot happen till the state governments decide that a safe environment needs to be created. The Election Commission should take this very seriously, because this kind of violence is more likely to skew results than random speeches by politicians, or even their attempts to bribe the electorate. The desperation among the political parties to grab power is apparent. But what kind of a democracy does this use of force make us? Author/Columnist, Winner of Costa First Novel Award for Witness the Night. Her 3rd novel The Sea of Innocence is out.